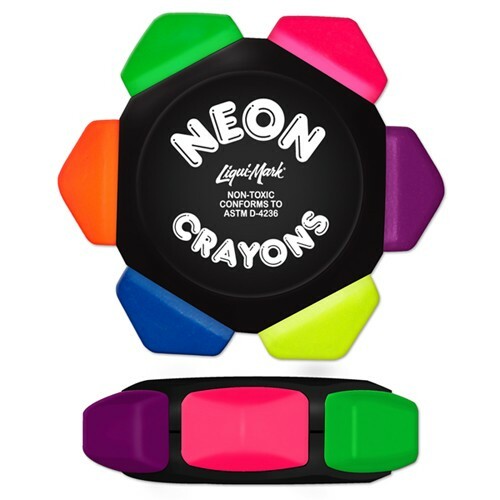 **NEW** NEON® Six Color Crayon Wheel offers the advantage of a box of six NEON crayons in one easy-grip wheel! Perfect for creative little hands at home, at school, or on the go. Great for restaurants, hospitals, daycare centers and doctor's offices! Color Selection: Black Housing with crayon colors: Neon Pink, Purple, Yellow, Blue, Orange & Green. Additional Color/Second Side Imprint: Add $0.25(g) Per color/location. Packaging: Bulk 120 @ 9 lbs.